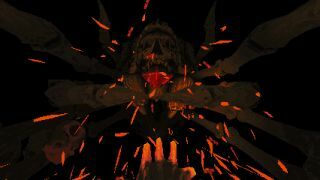 Devil Daggers is a first-person, retro backpedal-'em-up set in an unspecified hellplane that released yesterday on Steam after a few months on Greenlight. An average player (like me) might survive between 45 and 60 seconds in this horrific twitch-FPS nightmare, but b0necarver is not average. b0necarver, who I propose we label "The Man Who Circle-Strafed Hell Itself" or "The Michael Jordan of Hell," currently holds the record for the longest run in Devil Daggers, which you can watch in-client through its leaderboard, or in the video above. Even if you haven't played Devil Daggers yet, the run, which beats its nearest competitor by 51 seconds, borders on hypnotic: the equivalent of watching Satan do 360 noscopes for eight continuous minutes. May we all aspire to such sick, mind-fraying skull slaying.